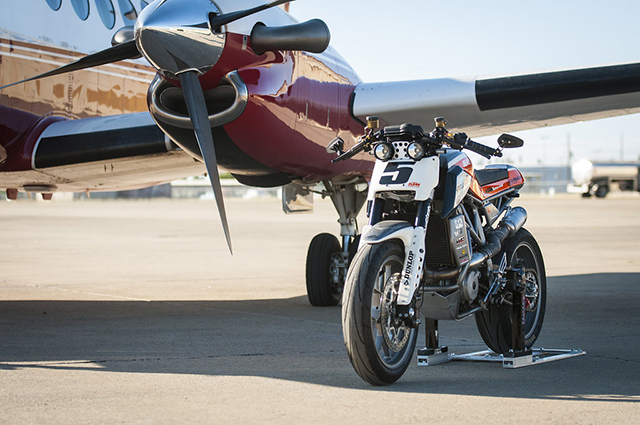 For a car guy, he sure builds an amazing motorcycle; that was the consensus a few years back when Darrell Schneider from DS Restorations (DSR), an award winning car builder of many decades, turned his hand to custom bike building and truly knocked it out of the park with his DSR GP250R café racer. Three years later he’s back with another bike build and just like before the workmanship is first class and it’ll leave many debating once again how exactly do you categorise a DSR build. 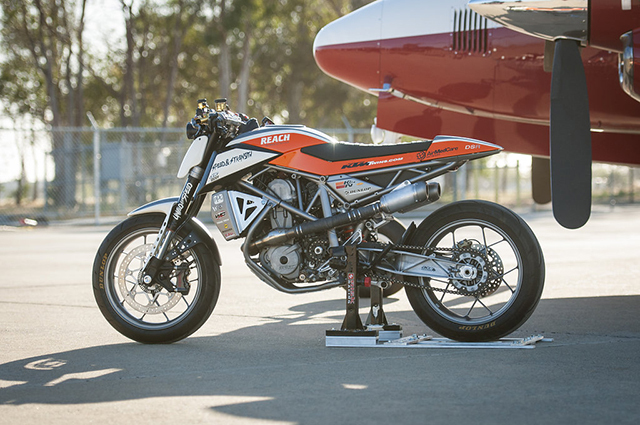 Starting with a 2013 KTM 690 Duke “The goal was to redesign the bike with a factory race bike theme without loosing the distinct KTM angular, edgy style. 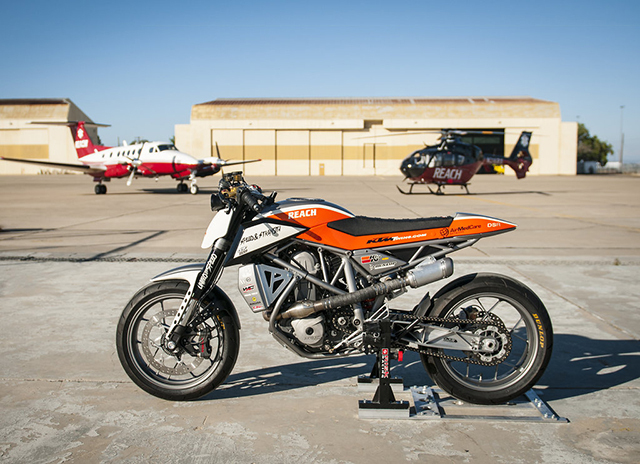 I wanted people to see KTM (design and color) but wonder what model or class it was in” explains Darrell. We think he nailed it. 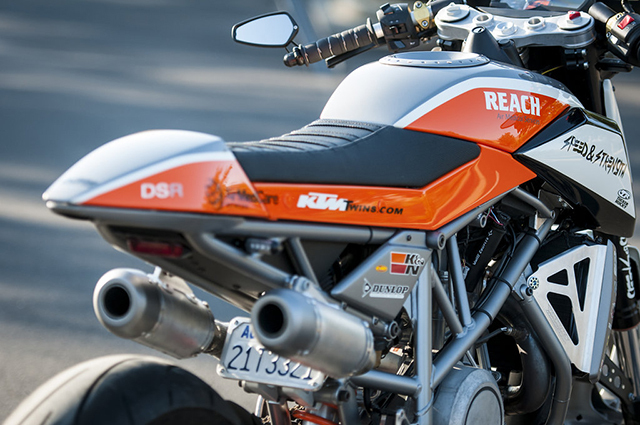 The 690 Duke is a serious bit of kit straight out of the box, a powerful and punchy single cylinder, low weight and brilliant handling – as good in traffic as it is to thrash through the twisties. 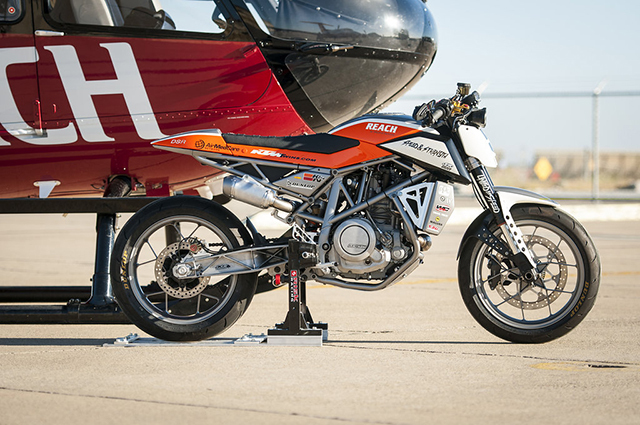 But the already flawless build and KTM body work can leave customisers with only small improvements to be made in each area, that is of of course unless you are Darrell Schneider and you partner up with some of the best builders and fabricators around. Darrell also had the support of major sponsors KTMtwins.com, Reach Air Medical Service/Air Med Care, Speed And Strength and a host of parts suppliers to make it all possible. Before the extensive body changes could be made, a new subframe was fabricated from chromoly and the battery now stored in a custom aluminium box that also houses many of the electrical components. The frame lower cradle and bars for the skidplate were also fashioned out of chromoly while the plate itself comes from the good folks at Works Connection who also supplied the now modified radiator braces. The radiator covers are made from Darrell’s specialty – fibreglass – with the same material also used to form the air cleaner covers and fuel cap surround. Darrell had also made the bucks for much of the panel work when Jimmy Kilroy said he’d have time to do them out of aluminium instead. Jimmy is no ordinary metal guy, he builds one off bodies for some of the best cars on the planet – no filler here – this is just sheer fabricating artistry. 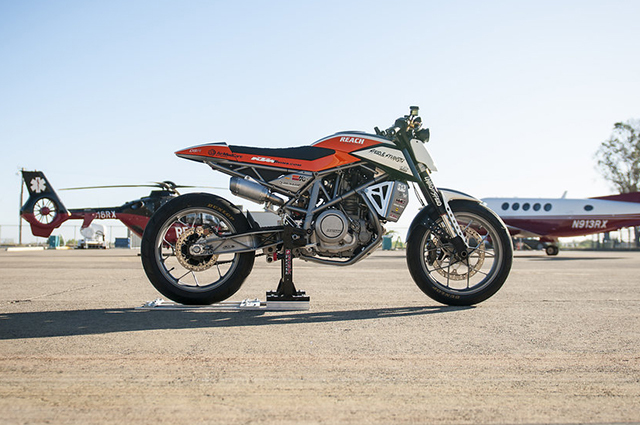 From the fuel tank and it’s cover, to the side panels and the seat filler panels the work is simply flawless, the sort of quality you would find done by the best coachbuilder’s on the most exclusive cars, but performed instead on a humble KTM. The stunning front fender and rear item are also aluminium with more of the desired race look coming from the hand formed front number plate. 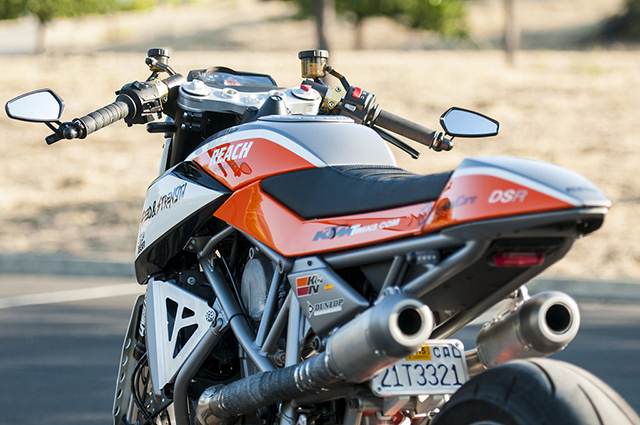 The seat is one of the more distinctive elements of the bike creating a very different visual line to that of the stock 690 Duke. The seat pan was formed using aluminium before foam was shaped to fit Darrell’s design and then covered in Factory Effex material. Just like the engine covers the swingarm has been stripped of its OEM black to reveal the raw metal and what is truly a beautifully designed piece of kit. 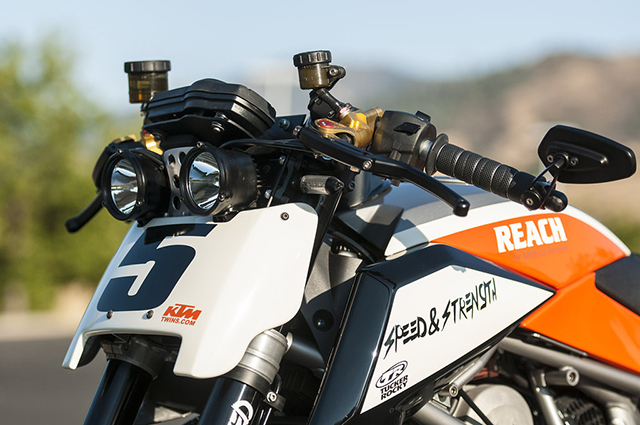 It further adds to the racing vibe of the build, although there are well hidden concessions to road use with a neat tail light and indicators hidden under the seat, small CRG mirrors and Trail Tech off road lights. 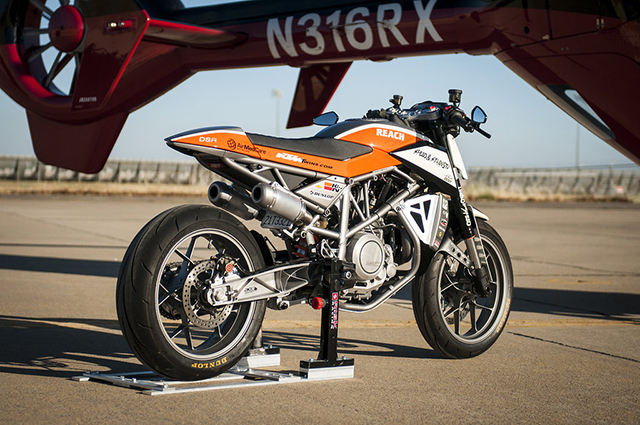 Helping in the design of both Darrell’s bike builds has been Alberto Hernandez and the paint scheme they have chosen not only shows off the exceptional body work but also gives you no doubt that this is a KTM. Orange, white, silver and black, there is no powdercoating or rattle cans here, just some of the best PPG paint work you’re ever likely to see on such a build. The 690cc liquid cooled single cylinder pumps out a healthy 70bhp straight from the box but Darrell wanted to push those numbers and he used only the best of bits to get it done. The exhaust is trick combination of custom fabrication and FMF 4.1 dual muffler, dual mega bomb system. You don’t see too many singles featuring such a set up, let alone running side mounted pipes, but with a little heat wrap it looks sensational and adds more than a touch of snap, crackle and pop. To get the engine breathing easier on the inlet side the folks at K&N came to the party with one of their world class filter units and also supplied the same for the oil. 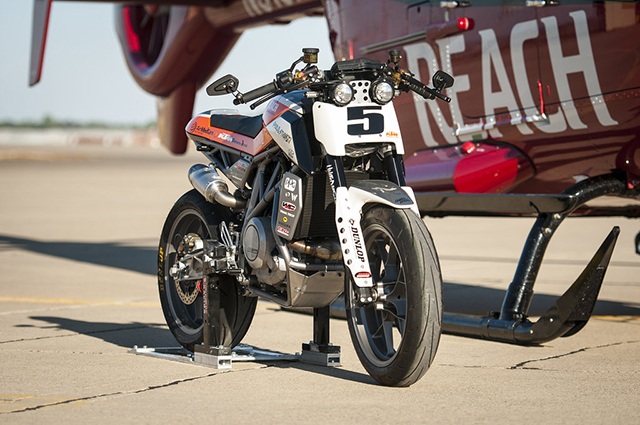 With air coming in and out of the engine with a great deal more freedom putting the Duke on the dyno show’d a need for more fuel. That’s taken care of by the fully tuned Dynojet Power Commander V that Darrell says adds the “equivalent of 3 main jet sizes”. The engine was finished off by removing the dark matte paint from the engine covers leaving a look as raw as the powerplant itself! 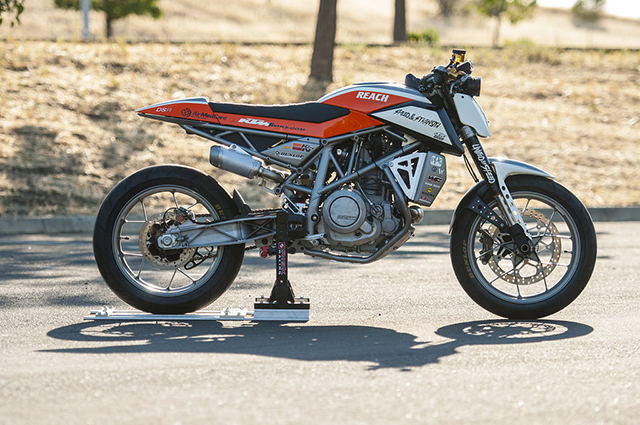 This build though is not just a beautiful bike that is quick in a straight line, a lot of work and high end components also went into making sure this Duke carves canyons like no other. 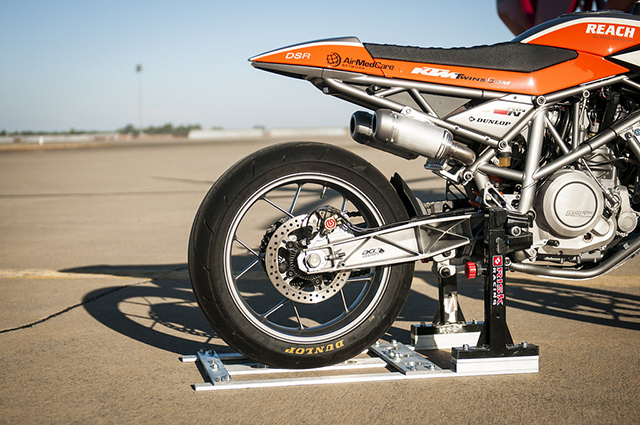 The suspension is all WP R model items, from the front forks and clamps to the rear shock. The wheels have been rid of their casting marks and smoothed out before mating up to a set of Dunlops ultra sticky, road and track hypersport tyre the Q3. Braking is as good as it gets with a Brembo HP caliper up front and the same used on the rear mounted on a custom CNC bracket. To ensure feel is just right the brake and clutch both use Magura HC3 radial pumps with Galfer front brake and clutch lines. 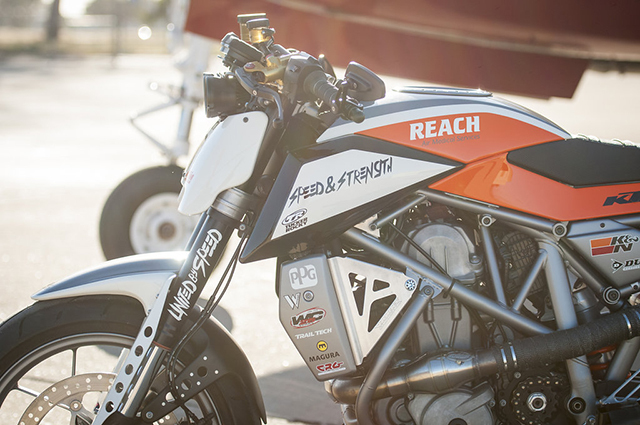 Steering duties are taken care of by Woodcraft clip-ons and risers while Sato Racing rearsets give the rider picture perfect control with their feet. 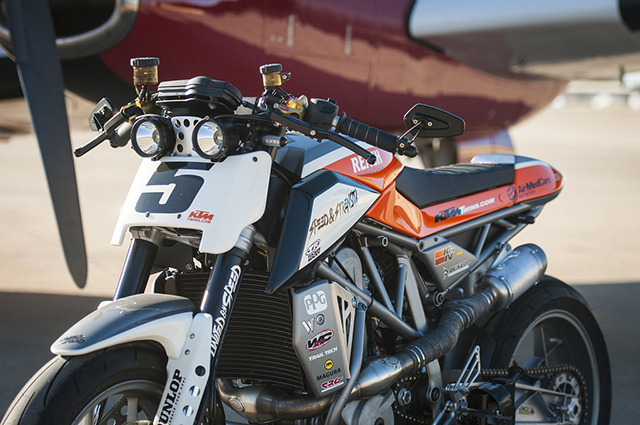 Unscrew the KTMtwins.com billet gas cap, fuel it up and this 690 is ready to rumble on the road, track or hold it’s own as a static display amongst elite show winning competition and has also been seen at a round of the WSBK and the Monster Energy Super Cross. It all goes to show what an incredible talent Darrell is and how well he has adapted his car building skills to the world of two wheels. 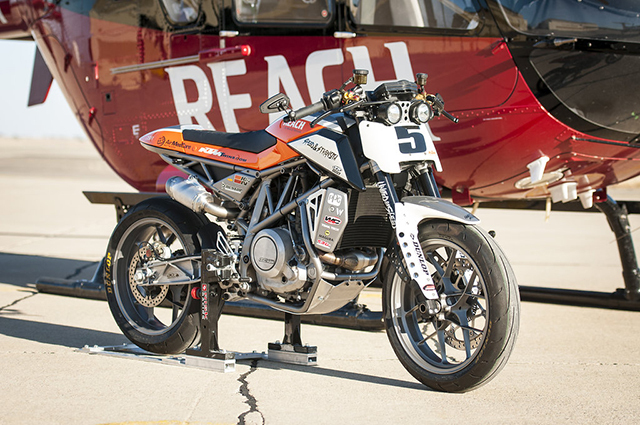 But he’s also the first to admit that he’s had amazing help along the way and in addition to those already mentioned Craig Watts, Curt Hill, CJ Pullman, Robert Smith and Dave Moal have all played a role in crafting what is arguably the best 690 Duke ever created. We hope he keeps them coming.